What is Green Ox® Pallet Technology®? Green Ox Pallet Technology is a corrugated pallet that allows for cost savings and efficiencies in the handling, storage, and transportation of products. Our technology helps companies overcome many of the supply chain challenges that affect their performance, both operationally and economically. In addition, our pallets provide sustainability benefits by helping companies reduce their overall environmental footprint. What makes Green Ox pallets different than wood pallet options? 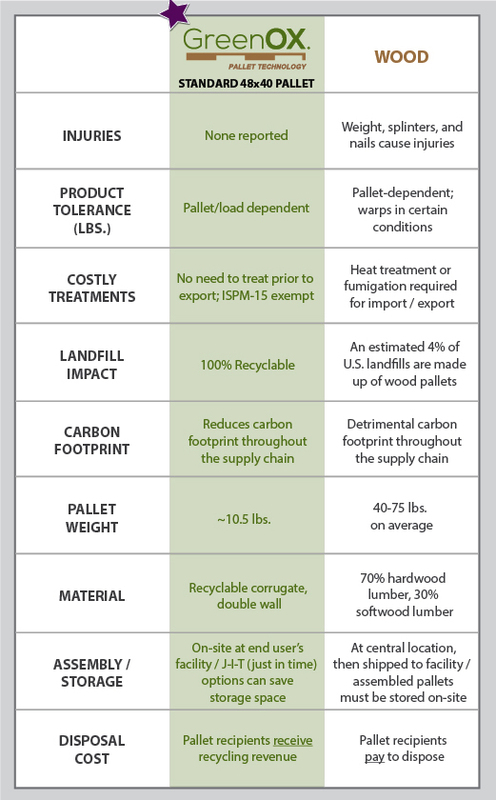 Please reference the chart below for key differences between Green Ox Pallet Technology (standard 48×40 pallet) and wood pallet options. What makes Green Ox pallets different than other corrugated pallet options? The Green Ox Pallet is unlike other pallet options. The simple, seamless design of our pallets allows them to be manufactured when you need them, where you need them, allowing for J-I-T provisioning (reducing space requirements and maximizing operational efficiencies). In addition, our pallets provide confidence in performance as supported by third-party, ISTA testing results. What cost savings opportunities does Green Ox Pallet Technology offer and how does pricing compare between a Green Ox pallet and a traditional wood or plastic pallet? Adoption of Green Ox Pallet Technology creates 33 potential cost savings opportunities in seven categories throughout a company’s entire supply chain, including product handling, storage, receipt of shipment, and pallet disposal. There are many factors besides the initial purchase price that determine the cost of a pallet over the course of its lifecycle, including expenses incurred during usage. Let us demonstrate our savings opportunities so you can understand the true cost savings of Green Ox pallets versus wood, plastic, or metal pallets. Contact us to learn more. What are Green Ox pallets made from? What are the load tolerances for Green Ox pallets? The load tolerance of Green Ox pallets are evaluated on a case-by-case basis based on load weight/distribution, load configuration, shipment type, unitization, and pallet use. Do Green Ox pallets require sterilization for food, pharmaceutical or sterile environments? No, unlike wood pallets that can harbor insects, bacteria, and animal waste, Green Ox pallets are 100% sterile when produced and are safe for transporting food and other products susceptible to contamination. Green Ox pallets require no treatment for import / export and are also ISPM-15 exempt. Can Green Ox pallets withstand moisture, freezer, and cooler environments? Yes, Green Ox pallets come with an optional water-resistant coating that does not affect recyclability. Can you rack Green Ox pallets? We do not recommend using our product on an open rack system; however, we do recommend using Green Ox pallets in OSHA-approved cross-beam or fully-enclosed racking systems. Standard wood pallets come in a 48” x 40” configuration. Can Green Ox pallets be produced to other size configurations and requirements? Yes, we can design custom sizes for your specific needs as well as produce display-ready promotional pallets. Where are Green Ox pallets produced? Green Ox pallets can be produced anywhere for delivery to your company when needed. What are the storage space requirements of Green Ox pallets? Our pallets can be shipped to you as KDF (knock down flat) units, greatly reducing storage space requirements. In addition, our pallets can be produced using J-I-T (just in time) provisioning, thereby reducing the need for you to continually store a large quantity of pallets in your warehouse. Can I get Green Ox Pallets already assembled? Yes, we can deliver assembled, ready to load pallets to your door.